It’s time to catch up on some news released over the last few days. 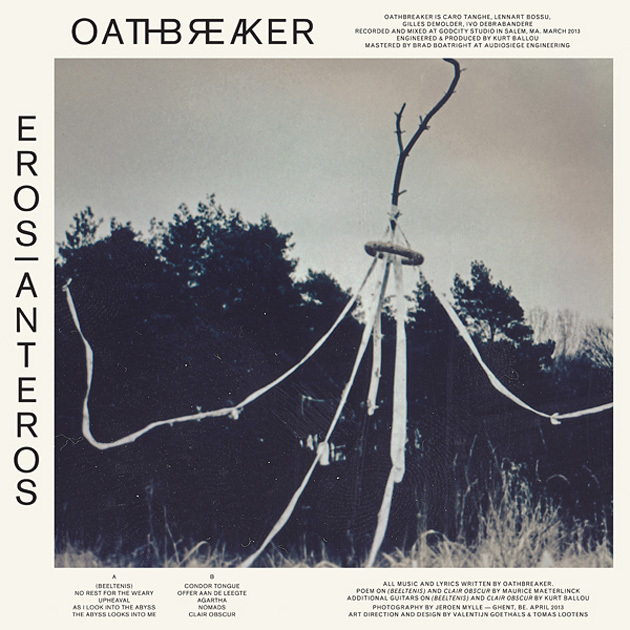 Of course, you’ve probably been soaking in the new Gorguts song quite a bit but on the other end of the spectrum, Belgium’s Oathbreaker are readying the release of their new LP Eros|Anteros, through Deathwish on August 20th, which will be the follow-up to 2011’s utterly blistering (and year highlight) Maelstrom. The band is now streaming a new cut from the record called ‘Condor Tongue’, which you can check out on Brooklyn Vegan. Oathbreaker’s penchant for short bursts of adrenaline is in tow with searing buzzsaw riffs and Caro’s vocals just as caustic as ever. In other news, Satyricon have finally emerged from the darkness again with the announcement of a new album, this time a self-titled, for release on September 9th. They also unveiled the artwork, below, and info on some European tour dates that includes Dublin’s Button Factory on November 12th and a Belfast date the night before. oathbreaker: new band to check out!